The New Corel Painter 2015 Launches August 12, 2014! Check it out. I am so excited to announce that Corel Painter 2015 is available for download today. Go to Painter Artist, Corel Painter’s new website for your copy. I also want to let you know that I will have a class at the Digital Art Academy starting on August 19 called Corel Painter 2015 – What’s new. This link will take you to the Digital Art Academy new site. 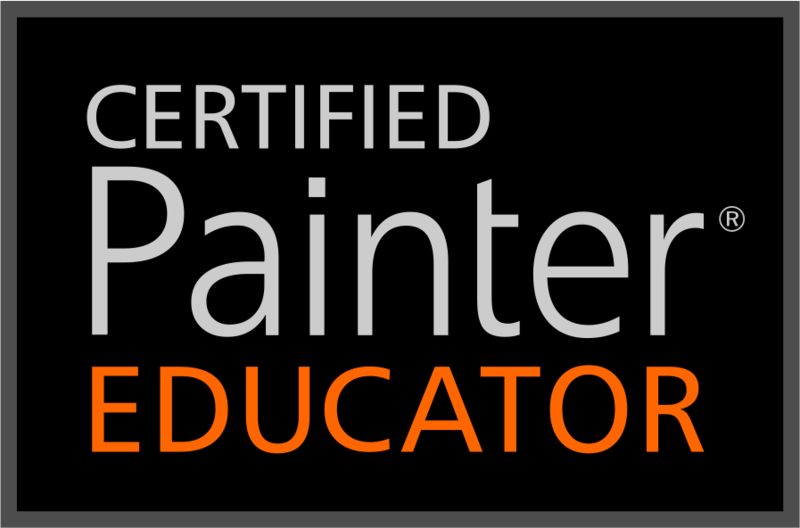 When you get there, click on the Advanced Painter Classes or the link on the side to my class. There you can read the syllabus and register for the class. I hope you join me. Corel Painter 2015, like its predecessors, is a very complex program. There are lots of new and exciting enhancements to the program. Let’s hit a few high spots, but do take my class for an in-depth look at what is new in Corel Painter 2015. Corel Painter 2015 is by far the fastest version so far…and the most responsive. Native 64-bit is available for Macs, but there is also significant cross-platform CPU performance optimizations. Mac users will notice a significant increase in processing power, all platforms will notice brushes, on average, are 40% faster. There are tons of added features. Here is a quick video showing the enhancements to the welcome screen. There are some cool new preferences. My favorite are the Simple Toolbox and the Command Bar. I will tell you all about them in the class as well as some stuff about new arrangements. This might be a good time to show you some of my artwork done in Painter 2015. I did a series of wheat fields; some done mostly with the new particle brushes. In the next two paintings, I used particle brushes almost exclusively. Do go to Corel Painter’s new Website and have a look around. And, I hope you will join me in my class, Corel Painter 2015 – What’s New. This link will take you directly to the advanced classes where you will find my class. While you are there, do check out the other wonderful classes at the Digital Art Academy. Look for a link to Jason Maranto’s online free Painter 2015 Manual…it is fabulous. This entry was posted in 2014 Corel Painter Posts and tagged Corel Painter 2015, Corel Painter 2015 Classes, Corel Painter 2015 What's New. Bookmark the permalink. Yes, this is an upgrade and there is a cost. If you just got X3, you might try calling sales and see if you can get a free upgrade or at least a better price. I have no idea if this is possible or not. The current upgrade is $229.00. Scott…just got word that if you are a registered user of X3, for the next 30 days, you can get the upgrade for $99. Skip!!! a new Painter version… great! How nice the new DAA site as well. Thank you so much! Hi Skip Downloaded the trial version. Quick question I have many brushes in X3 (including yours} that are not standard. Can I import them into 2015? Yes you can. Just export from X3 and then import into 2015. Hi Skip Allen. I have a question. I cannot afford the full painter program and I am not finding Gimp to my liking. I noticed that their is a painter light available. After being away from computer art for over two years, I am wondering if that might be just right to launch me back into the Corel family. I see you teach some classes for this application and I would value your judgment of this program if You have a moment to reply. So good to hear from you. I hope all is well with you. I like Painter Lite. It doesn’t have all the bells and whistles, but for a traditional painter such as yourself, I think you will find it enjoyable. Hi Skip…. It’s great to see the wonderful work you’ve been doing with Particle brushes! And now I want to pick your brain! I am ready to sell my domain name *digitalpainting.com *. Can you suggest any companies or artists (with deep pockets) I could approach with an offer? That is a great domain name. I wish I had a bunch of coins. I would grab it myself. Maybe someone will see this post and contact you. I love the new Painter. You are so kind with your comments. Thank you bunches. Skip- thanks for the heads-up on the new upgrade for painter. You are very welcome. Thanks for taking the time to make a comment.